Colorado, USA: You have to love it when traffic sign writers use sarcasm. This one, in particular, caught my eye. 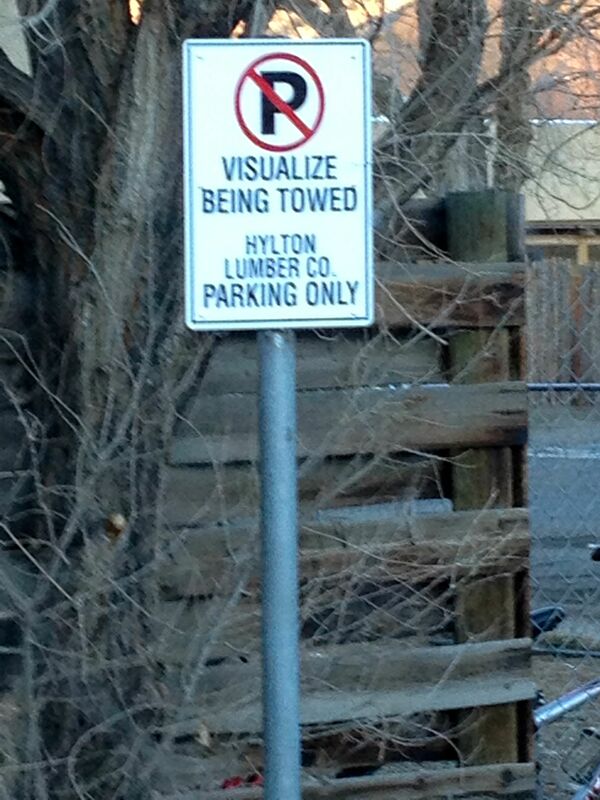 Definitely, by conjuring up an image of my minivan being towed, I thought twice about parking in this spot. This entry was posted in Colorado, Funny signs, Humor, Travel, Travel Humor, Travel Oops, Uncategorized, United States of America, Words and tagged being towed, sarcastic sign by stephglaser. Bookmark the permalink. There is nothing more annoying and humiliating than having to go and retrieve your motor from a car pound. A it’s a bore, B it’s a chore and C it’s very expensive! I know, I’ve had to do it twice!! I sooo hear you, Lottie. I had my car towed during the aftermath of a blizzard when the city of Minneapolis typically goes ballistic towing cars so the plows can get through. Fair enough although it was a huge pain! Great sign. Probably works better than a regular one too. Back when my kids showed horses at the county fair, we found that a sign on the stall saying “I Bite” only encouraged people to stick their fingers through the bars to see if the pony really would bite them. (And he would – bit someone every fair.) So we changed it to “Fingers Are Tasty, Can I Have Yours?” Which worked far better at keeping random people’s fingers out of the pony’s teeth. Thank you for the comment! That is hilarious how you and your kids modified your sign for your horse that had chomping tendencies. Very funny and thanks for sharing that! I think you’re right in that people respond to a statement that’s a little out of the ordinary. Cheers! I actually like this sign, because it makes people think about the consequences of their actions a lot more than just a ‘P’ with a red line through would. 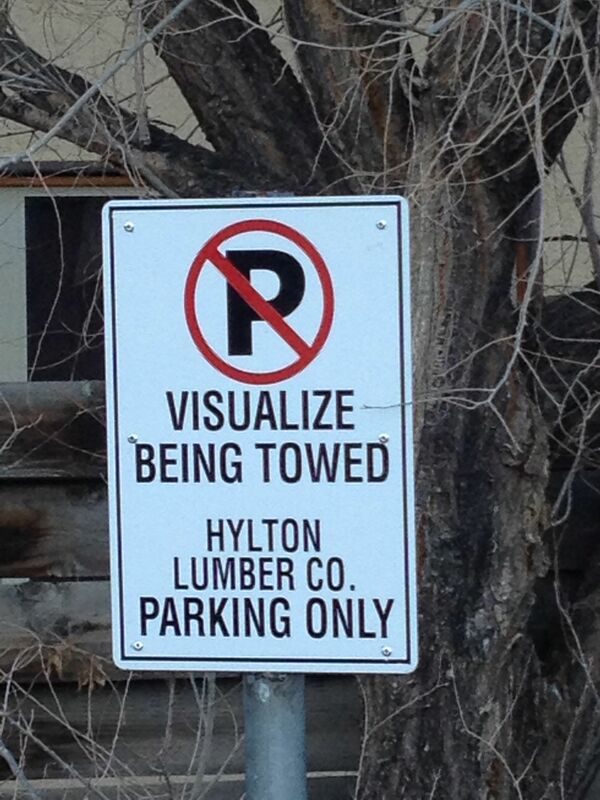 I bet few people get towed! Definitely — I pulled into the parking lot of this lumber business because I needed to turn around, and the sign caught my eye and caught me off guard right away. I got out of my car and took a photo of it immediately! This is funny…new age signage.